This is a list of science fiction novels, novel series, and collections of linked short stories. It includes modern novels, as well as novels written before the term "science fiction" was in common use. This list includes novels not marketed as SF but still considered to be substantially science fiction in content by some critics, such as Nineteen Eighty Four . As such, it is an inclusive list, not an exclusive list based on other factors such as level of notability or literary quality. Books are listed in alphabetical order by title, ignoring the leading articles "A", "An", and "The". Novel series are alphabetical by author-designated name or, if there is none, the title of the first novel in the series or some other reasonable designation. A novel is a relatively long work of narrative fiction, normally written in prose form, and which is typically published as a book. 334 is a science fiction novel by American author Thomas M. Disch, written in 1972. It is a dystopian look at everyday life in New York City around the year 2025. The dust cover design for the first edition was by Michael Hasted. Thomas Michael Disch was an American science fiction author and poet. He won the Hugo Award for Best Related Book – previously called "Best Non-Fiction Book" – in 1999, and he had two other Hugo nominations and nine Nebula Award nominations to his credit, plus one win of the John W. Campbell Memorial Award, a Rhysling Award, and two Seiun Awards, among others. 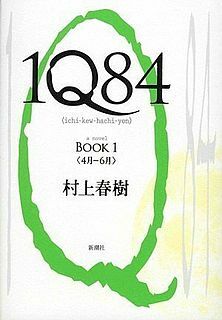 1Q84 is a dystopian novel written by Japanese writer Haruki Murakami, first published in three volumes in Japan in 2009–10. It covers a fictionalized year of 1984 in parallel with a "real" one. Its first printing sold out on the day it was released and sales reached a million within a month. The English-language edition of all three volumes, with the first two volumes translated by Jay Rubin and the third by Philip Gabriel, was released in North America and the United Kingdom on October 25, 2011. An excerpt from the novel, "Town of Cats", appeared in the September 5, 2011 issue of The New Yorker magazine. The first chapter of 1Q84 had also been read as an excerpt in the Selected Shorts series at Symphony Space in New York. Trullion: Alastor 2262 (1973) is a science fiction novel by American writer Jack Vance, first published by Ballantine Books. It is one of three books set in the Alastor Cluster, "a whorl of thirty thousand live stars in an irregular volume twenty to thirty light-years in diameter." Three thousand of the star systems are inhabited by five trillion humans, ruled by the mostly hands-off, laissez-faire Connatic, who occasionally, in the manner of Harun al-Rashid of The Thousand and One Nights, goes among his people in disguise. Marune: Alastor 933 (1975) is a science fiction novel by Jack Vance, the second of three books set in the Alastor Cluster, ‘a whorl of thirty thousand stars in an irregular volume twenty to thirty light-years in diameter’. Three thousand of the star systems are inhabited by five trillion humans, ruled by the mostly hands-off, laissez-faire Connatic, who occasionally, in the manner of Harun al-Rashid of The Thousand and One Nights, goes among his people in disguise. The novel was preceded by Trullion: Alastor 2262 (1973) and followed by Wyst: Alastor 1716 (1978). Wyst: Alastor 1716 (1978) is a science fiction novel by Jack Vance first published by DAW Books. It is the third and last novel set in the Alastor Cluster, a group of thousands of stars and planets ruled by the mysterious Connatic, which is a part of Vance's Gaean Reach. The Angry Espers by Lloyd Biggle, Jr.
Absolution Gap is a 2003 science fiction novel written by Welsh author Alastair Reynolds. It takes place in the Revelation Space universe and is a direct sequel to Redemption Ark. Alastair Preston Reynolds is a British science fiction author. He specialises in hard science fiction and space opera. He spent his early years in Cornwall, moved back to Wales before going to Newcastle University, where he read physics and astronomy. Afterwards, he earned a PhD from the University of St Andrews. In 1991, he moved to Noordwijk in the Netherlands where he met his wife Josette. There, he worked for the European Space Research and Technology Centre until 2004 when he left to pursue writing full-time. He returned to Wales in 2008 and lives near Cardiff. Charles David George "Charlie" Stross is a British writer of science fiction, Lovecraftian horror, and fantasy. Stross specialises in hard science fiction and space opera. 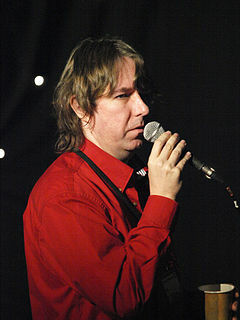 Between 1994 and 2004, he was also an active writer for the magazine Computer Shopper and was responsible for the monthly Linux column. He stopped writing for the magazine to devote more time to novels. However, he continues to publish freelance articles on the Internet. Breakfast of Champions (or Goodbye, Blue Monday!) by Kurt Vonnegut, Jr.
Cat's Cradle by Kurt Vonnegut, Jr.
Digital Devil Story by Aya Nishitani. The Gripping Hand by Larry Niven and Jerry Pournelle. Released as The Moat Around Murcheson's Eye in the United Kingdom. namely, Halo: The Fall of Reach by Eric Nylund, Halo: The Flood by William C. Dietz, Halo: First Strike by Eric Nylund, Halo: Ghosts of Onyx by Eric Nylund, Halo: The Cole Protocol by Tobias S. Buckell, Halo: Contact Harvest by Joseph Staten, Halo: Evolutions (Essential Stories From The Halo Universe) by various authors, Halo: Evolutions (Volume 2) by various authors, Halo: Cryptum by Greg Bear. Infinity Beach by Jack McDevitt. Released as Slow Lightning in the United Kingdom. Slow Lightning by Jack McDevitt. Released as Infinity Beach in the United States. The World Menders by Lloyd Biggle, Jr. This literature-related list is incomplete; you can help by expanding it . 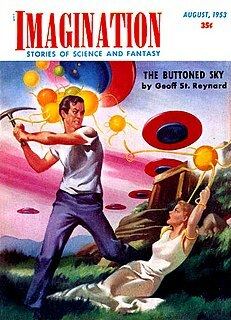 Randall Garrett was an American science fiction and fantasy author. He was a contributor to Astounding and other science fiction magazines of the 1950s and 1960s. He instructed Robert Silverberg in the techniques of selling large quantities of action-adventure science fiction, and collaborated with him on two novels about men from Earth disrupting a peaceful agrarian civilization on an alien planet. X Minus One was an American half-hour science fiction radio drama series broadcast from April 24, 1955 to January 9, 1958 in various timeslots on NBC. Known for high production values in adapting stories from the leading American authors of the era, X Minus One has been described as one of the finest offerings of American radio drama and one of the best science fiction series in any medium. The Damon Knight Memorial Grand Master Award is a lifetime honor presented annually by the Science Fiction and Fantasy Writers of America (SFWA) to no more than one living writer of fantasy or science fiction. It was inaugurated in 1975 when Robert Heinlein was made the first SFWA Grand Master and it was renamed in 2002 after the Association's founder, Damon Knight, who had died that year. Planetary romance is a subgenre of science fiction or science fantasy in which the bulk of the action consists of adventures on one or more exotic alien planets, characterized by distinctive physical and cultural backgrounds. Some planetary romances take place against the background of a future culture where travel between worlds by spaceship is commonplace; others, particularly the earliest examples of the genre, do not, and invoke flying carpets, astral projection, or other methods of getting between planets. In either case, it is the planetside adventures which are the focus of the story, not the mode of travel. Barlowe's Guide to Extraterrestrials is a science fiction book by artist Wayne Barlowe, with Ian Summers and Beth Meacham. It contains Barlowe's visualizations of different extraterrestrial life forms from various works of science fiction, with information on their planetary location or range, biology, and behaviors, in the style of a real field guide for animals. It was nominated for an American Book Award and for the 1980 Hugo Award for Best Related Work. A fix-up is a novel created from several short fiction stories that may or may not have been initially related or previously published. The stories may be edited for consistency, and sometimes new connecting material, such as a frame story or other interstitial narration, is written for the new work. The term was coined by the science fiction writer A. E. van Vogt, who published several fix-ups of his own, including The Voyage of the Space Beagle, but the practice exists outside of science fiction. The use of the term in science fiction criticism was popularised by the first (1979) edition of the Encyclopedia of Science Fiction, edited by Peter Nicholls, which credited van Vogt with the creation of the term. 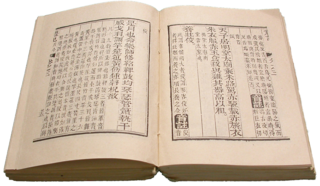 The name comes from the modifications that the author needs to make in the original texts to make them fit together as though they were a novel. Foreshadowing of events from the later stories may be jammed into an early chapter of the fix-up, and character development may be interleaved throughout the book. Contradictions and inconsistencies between episodes are usually worked out. The Road to Science Fiction is a series of science fiction anthologies edited by American science fiction author, scholar and editor James Gunn. Composed as a textbook set to teach the evolution of science fiction literature, the series is now available as mass market publications. Top Science Fiction: The Authors' Choice is an anthology of science fiction short stories edited by Josh Pachter, the second in his series of "Authors' Choice" anthologies. It was first published in hardcover by J. M. Dent in July 1984, with a trade paperback edition issued by the same publisher in 1985. The book has also been published in translation in the Netherlands, Argentina, Germany and Finland. Alpha 3 is an anthology of science fiction short works edited by Robert Silverberg. It was first published in paperback by Ballantine Books in October 1972.